In Many Worlds If Any, his fourth solo show at Klaus von Nichtssagend, Barry Stone continues to stretch the philosophical positions of his artistic practice within a world growing exponentially saturated with digital images. The show features seven framed photographs that employ various methods of depiction and perceptual distortion. The traditional formatting of the show belies Stone’s interest in the materiality of digital media in a continuum of image manipulation and “straight” photography. While three of the photographs are made using conventional digital camera work, the others have been altered by changing the code of the digital image. This is done by converting the image file into a text document and rearranging the resulting data. Converting the document back into an image file then yields glitches, artifacts, and other digitally induced anomalies. This massaging of the code, sometimes referred to as databending, is done relatively blindly and is a process akin to a kind of meta-collage. 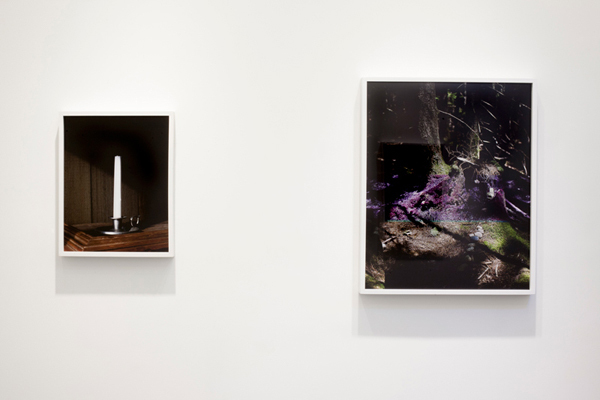 Stone’s photographic subjects play upon visual archetypes ranging from rainbows and caverns to a burnt candlestick. Other photos offer scenes of a wooded commons designated for children to make fairy houses. These latter pictures have been subjected to the databending process, and their random distortions of form, color, and light create an otherwise hidden magical spectacle. The works in the show look to the shifting position that images inhabit in photography. Among the continued mass conversion of the observable world into lines of digital code, Stone positions himself in the cracks between as a maker of images based on a “true” reality and the slippery realm of the unreliable narrator, suggesting a multiplicity of meanings, perceptual translations, and poetic possibilities. Barry Stone lives and works in Austin, Texas. His work will be featured in zingmagazine Winter 2013. He has exhibited at the International Center for Photography and Artist’s Space in New York, at the Austin Museum of Art in Austin, Texas, and at the Lawndale Art Center in Houston, Texas. His work is in the collection of the Museum of Fine Arts, Houston.